Trailheads is taking a bit of a breather this week, but I wanted to wish you all a happy and healthy 2014. The Scranton Times-Tribune covered the Anthracite Heritage Museum's Toy Showcase program, and Daniel Boone Homestead shared photos from their rescheduled "Here Comes Santa Claus" program on Facebook. Last week's post has info on events today through New Year's Eve. All sites on the Trails of History will be closed on January 1. Trailheads will be back next week with the January program listing and we'll catch up on any other news that we missed. All sites on the Pennsylvania Trails of History will be closed on Dec. 25 for Christmas, with the very notable exception of Washington Crossing Historic Park (visit their website for program details). This time of year, it’s always a good idea to check with the site you want to visit to confirm operating hours. Winter weather has been causing all kinds of fun on the Trails of History, mostly creating a snowy backdrop for holiday programs, but disrupting some as well. Daniel Boone Homestead had to reschedule their event from last weekend to tomorrow, where Santa will be greeted with temps in the 50s. Last week’s post included links to photos of programs from the first part of December. This week, I’d like to point you toward photos from Erie Maritime Museum and Flagship Niagara, Landis Valley Village and Farm Museum, and Eckley Miners’ Village. 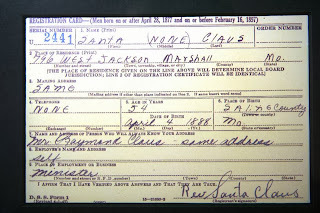 The Pennsylvania Military Museum shared a copy of Santa’s World War II draft card on their Facebook page. They explain that their copy was donated by a friend of the museum who received it during a speaking engagement in Missouri. 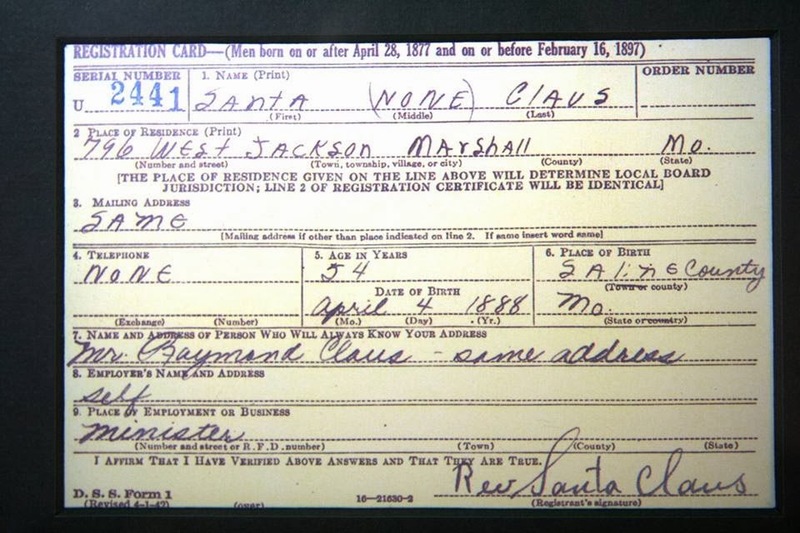 If you need additional documentation, you can also see a copy of Mr. Claus’s WWI draft registration online. If you’re shopping for last-minute gifts (you know, to supplement what Santa will be bringing), don’t forget the museum stores on the Trails of History for books, local arts and crafts, Pennsylvania food items, and other good stuff. Ephrata Cloister will present their annual Lantern Tour program, Dec. 26-29 (I strongly advise calling the site at 717/733-6600 to check on ticket availability), 6:30-8 pm. 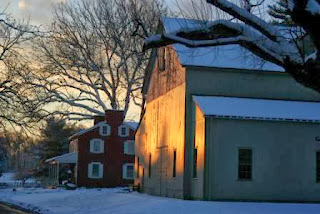 Landis Valley Village and Farm Museum offers a Winter Day Camp for kids Dec. 26 & 27. Registration is required; call 717/569-0401. The Railroad Museum of Pennsylvania’s photography exhibit, “From Your Lens: Images of Contemporary Railroading,” closes on Dec. 31. Young children and their families can ring in 2014 a few days early as part of the State Museum’s “Noon Year’s Eve” program, Dec. 27, 10 am-noon. On a non-Christmas topic, during 2014 Sarah Buffington, curator at Old Economy Village, will be blogging about the project to restore the homes of Harmony Society founder George Rapp and his adopted son Frederick. Thank you all for being Trailheads readers. Whatever you are celebrating in the coming weeks, I wish you warmth, joy, and light. The Pennsylvania Military Museum held its annual remembrance of the attack on Pearl Harbor, Oahu, Hawaii, Dec. 7, 1941. The event takes place against a backdrop of guns from the USS Pennsylvania, one of the American ships on the scene that Sunday morning. PMM posted photos of the ceremony on Facebook. 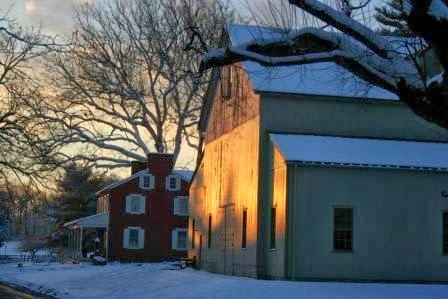 Sites and museums on the Pennsylvania Trails of History have been sharing lots of images of snow, holiday decorations, and programs. For a sampling, you might check out Landis Valley Village and Farm Museum, Pennsbury Manor, Eckley Miners’ Village, and Old Economy Village. In many cases, visitors have shared their own photos of programs on Facebook, which I always enjoy. One of the great things about social media, I think. FIG Lancaster, a magazine focused on art, culture, shopping and dining, did a photo shoot at the Railroad Museum of Pennsylvania for their holiday issue and shared a behind-the-scenes look via their Facebook page. The Pennsylvania Lumber Museum, currently undergoing a major building expansion and renovation, has a new website. In fact, you can learn about the new construction (and lots of other things) on the new website. If your holiday gift list includes people who like history, please don’t forget to shop the Trails of History. Options for online shopping include Landis Valley, the Railroad Museum, and ShopPAheritage; on-site visits are even more fun. A membership in the Friends or Associate group at your favorite site or the Pennsylvania Heritage Foundation is always a thoughtful gift—no need to worry about sizes, colors, or styles. The Hatboro-Horsham Madrigals performed at Graeme Park’s A Soldier’s Christmas at the end of November. Winter schedules are in effect at many sites on the Trails of History, so please be sure to check ahead before visiting. All sites will be closed on Dec. 25, with the exception of Washington Crossing Historic Park (see below for more info). Dec. 7: Christmas at Cornwall House Tour—This annual tour lets you explore private homes in the Cornwall/Lebanon area while supporting the Friends of Cornwall Iron Furnace. Tickets are $15 in advance (that would be today) at several locations in the community or, with a credit card, by calling 717/272-9711. On the day of the tour (i.e. tomorrow), tickets are $20 and can be purchased only at Cornwall Iron Furnace. (Your house tour ticket also entitles you to a tour of the Furnace during regular hours between Dec. 7 and Dec. 31.) 10 am-4 pm. Dec. 8: A Homestead Christmas—Explore English and German Christmas traditions, enjoy hot chocolate and wassail, visit with Santa, and shop for baked goods and gifts for the history-minded folks on your list. Admission: Adults (age 16+), $6; Children (age 5-15), $4; Friends of DBH, $0. Noon-4 pm. Dec. 14: Here Comes Santa Claus! Santa’s Workshop and Holiday Bonfire—This is a new event, with opportunities to make 18th-century style toys, sing carols by the fire, and shop for handmade ornaments and decorations. Plus a rare chance for an evening tour of the Boone house. Admission: Age 5+, $4; Friends of DBH, $0. 6-9 pm. Dec. 14: Santa’s Workshop—Children in grades 1-5 are invited to make a craft, watch a holiday movie, shop for gifts for family and friends, and share a snack. Registration is required and a fee is charged; call the museum at 814/827-2797 to sign up. 1-3 pm. Dec. 7-8: Children’s Christmas Program—Includes a tour of the village, a wagon ride, arts and crafts, storytelling, and a visit with Santa and Mrs. Claus. Admission: Adults (13+), $5; children (5-12), $10. Reservations required; call 570/636-2070. 1-4 pm. Dec. 7-8 & 14-15: Victorian Christmas—This program takes place in the 1861 Sharpe House and features Victorian decorations, tea, and cookies. Ornaments and teacups will be available for purchase as part of this fundraising event. Admission is free. 1-4 pm. Dec. 9-10: Christmas at the Cloister—This popular annual program combines traditional music (sung by the Ephrata Cloister Chorus) and readings. Admission: $6. Tickets are limited and may be sold out by the time you read this; call 717/733-6600. Programs at 6:30, 7:45, and 9 pm. Dec. 26-29: Lantern Tours—Tour the site and follow the story, presented by junior and senior high school students under the guidance of museum staff. Tours start every half hour and leave from the visitor center. Reservations are required and tickets do sell out; call 717/433-6600 to reserve your spot. 6:30-8 pm. Dec. 13: Christmas Tree Ship—This program features Niagara lit up for Christmas, lots of family activities, a visit with Santa, and a reading of Carol Crane’s maritime story “The Christmas Tree Ship.” Admission is free. Please bring hygiene products (toilet paper, toothpaste, facial tissues, etc.) or new infant items (onesies, booties, etc.) to help local families. Or you can sponsor a tree for $25 (contact Julie Wagner, 814/452-2744 x222 or jwagner@flagshipniagara.org). 5:30-8:30 pm (Santa arrives 6-ish). Dec. 7-8 & 14-15: Country Christmas Village—Enjoy a Pennsylvania German Christmas, with all kinds of trees, der Belsnickel, plus complimentary cocoa and gingersnaps. On Dec. 7 at 1 pm, handbell ringer Ron Bellamy will perform (find a preview on YouTube). Included in regular admission. 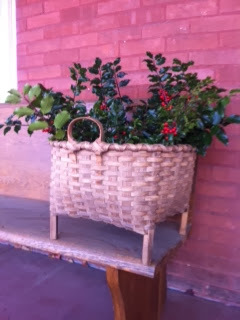 Dec. 7 & 14, 10 am-4 pm; Dec. 8 & 15, noon-4 pm. Dec. 13: Holiday at Landis Valley Bonfire—What’s not to like? Caroling, a blazing bonfire, wagon rides, hot cider and cookies. And it’s free—Landis Valley’s gift to the community. Return the favor by bringing canned goods to donate to the Lancaster Food Bank. 6-8:30 pm. Dec. 14: Days of the Belsnickel Lunch—Tour the village to see the holiday decorations and open hearth cooking, then enjoy a traditional home-cooked meal at the Landis Valley Hotel and shopping at the Landis Valley Museum Store. Der Belsnickel will be on hand to liven things up. Cost is $32.50 per person. Reservations required; call 717/581-0590 or email c-jschurin@pa.gov. 11 am. Dec. 21: Old Fashioned Children’s Christmas—Enjoy a visit to the one-room schoolhouse for Christmas-themed activities, including a take-home craft. Included in regular admission (no reservations required). 10 am-3 pm. Dec. 26-27: Winter Day Camp—A great way to keep everyone happy and sane during school break. Registration is required; for details call 717/569-0401 x228 or email c-sbrown@pa.gov. 8:30 am-4:30 pm. Dec. 7-8: Christmas at the Village—Enjoy Christmas carols sung by local choirs, shop for handmade wares by local craftspeople, and stop by the Granary for children’s activities and to see whether Belsnickel’s book has you down as naughty or nice. Admission: Adults (12-64), $12; Seniors (65+), $9; Youth (3-11), $5. Please start at the Visitor Center to purchase tickets and then proceed to the village. Dec. 7, 2-9 pm; Dec. 8, 2-7 pm. 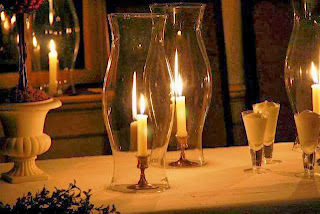 Dec. 14: Christmas Dinner—Join with other supporters of Old Economy for a festive evening of dining and music. Cost is $75 per person or $60 for Friends of OEV (you can also purchase a table for 6 or 8 people). Reservations are required by Dec. 7; call 724/266-4500 x 114. 6 pm. TONIGHT (Dec. 6): (the second night of) Holly Nights—A special opportunity to see Pennsbury illuminated by candlelight, bonfires, and hearth fires. Enjoy caroling, hot cider, and throwing a green sprig on the Yule log for luck. Entertainment schedule. Admission: Adults (12-64), $12; Seniors (65+), $10; Children (3-11), $6. The downloadable discount coupon is good for $1 off adult admission. 6-9 pm. Dec. 7: Pearl Harbor Remembrance Day Tribute—Gather with others beneath the guns of the USS PENNSYLVANIA (adjacent to the museum parking lot) to mark the 72nd anniversary of the attack on the US Pacific Fleet at Pearl Harbor, Oahu, Hawaii. 12:45 pm. Dec. 7 and 14: Home for the Holidays—Costumed engineers, conductors, ticket agents, and passengers representing the past century bring historic rail travel to life. Kids can visit with Santa or work with a telegrapher to send a Christmas telegram to the North Pole. Holiday music, refreshments (while supplies last), and shopping are part of the day too. Included in regular admission. 9 am-5 pm. Dec. 31: Final day to see the Museum’s 2013 special exhibit, “From Your Lens: Images of Contemporary Railroading.” Included in regular admission, during regular operating hours. Through Dec. 29: War of 1812 bicentennial exhibit—On loan from the Canadian Consulate, the exhibit looks at the war from different perspectives—American, Canadian, British, and Native American. Included in regular admission. Through Jan. 19: “A 20th-Century Christmas Tradition” features model trains from private collections and the Gruff Family Christmas Display from the museum’s permanent collection. Included in regular admission. Dec. 20: 3rd in the Burg/Learn at Lunchtime—Tour the "Chairs" exhibit with museum director David W. Dunn at 12:15 pm. Museum admission is free from 11 am to 1:30 pm. Dec. 21: Kwanzaa and Christmas Celebration—A collaboration of Nathaniel Gadsen’s Writers Wordshop, this program is a celebration of family. Food, music, workshops, and more. Admission is free. 10 am-3 pm. Dec. 27: Noon Year’s Eve—Ring in 2014 a few days early at this popular program for young children and their families. Dancing, crafts, and snacks leading up to the big firefly drop in Memorial Hall at noon. Included in regular admission. 10 am-noon. Dec. 7: A Night of REBELry—A festive fundraising event to support the programs at Washington Crossing. (I’m not sure if tickets are still available; best to call 215/493-4076 to check). Dec. 8: Dress Rehearsal—Historical demonstrations, activities, and the final rehearsal for the reenactment of the Christmas 1776 crossing of the Delaware by Gen. Washington and Continental troops. Admission: Adults (12+), $8; Children (5-11), $4. 11 am-3 pm (crossing is scheduled for 1 pm). Dec. 25: 61st Annual Christmas Day Crossing—Thousands of folks will be on hand to watch as Gen. Washington (portrayed by John Godzieba) and three Durham boats full of reenactors cross the Delaware River (weather permitting). The event is free. 1-3 pm.